They are ideal for family photos, kids' artwork, menus, signage, corporate headshots and more. This item is just one piece of clear Acrylic (PMMA) material block. This can help you to display and share your memories easy. Just remove the magnets to update your artwork or photos, it is so easy for updating new pictures. 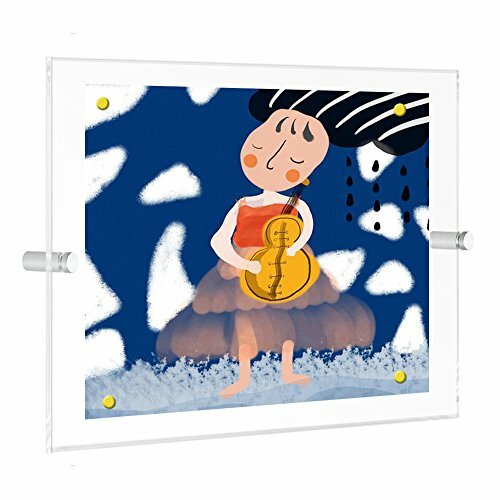 ELEGANT DESIGN: Super clear single 5mm thickness acrylic panel is made to display artwork in a elegant way. EASY FOR ASSEMBLY- Packed with hanging template for precision placement and intall instruction. Perfect to display degree, certificate, prints, art works for Office or Home on wall. Easy For Update Picture - Just remove the attached magnets to update your pictures, without disassemble the wall mounts. Good Condition Package: Each panel was protected by two thick protective film to confirm the panel won't scratched in transit. 100% GUARANTEE-Niubee guarantee 30 days money back and 1 year quality warranty, get our customer service support for any unhappy shopping experience.